"You may be surprised at how simple it looks—just ten little books in a box. But this simple method is the product of extensive research and testing on children's language acquisition. When learning a new language, grownups often prefer more structured teaching methods. Kids are wired differently. They like to jump in and learn without an instruction manual. They love learning through stories. And above all, they want to have fun! 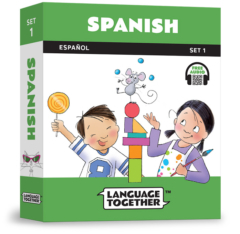 Language Together Set One blends humor and pedagogy, and effectively supplements language instruction at school and at home."